I took a trip from London to bring you today's Sunday Bridge. The Clifton suspension bridge that spans the Avon gorge, a grade I listed structure, is the symbol of the city of Bristol. Amazing capture, the bridge is wonderful, I wonder where were you in this moment, great work with your camera! How nice of you to travel for us! 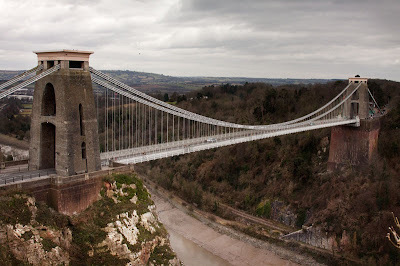 :-) It's a very nice architecture, I never realised the Avon had a gorge. Nice perspective you got on the bridge! Very pretty pic. Doesn't even look like England! Wow, that is quite an expanse. I think I would be a bit fearful crossing that one. Lovely looking area. Your photo makes this looks very delicate and graceful, whereas I'd always thought of it as quite a stocky bridge with those massive towers. Good to see a different viewpoint. This is a very imposing bridge, and what a view!! this is a beautiful bridge ! A beautiful bridge it is, too! «Louis» is a day late making his rounds to thank everyone who contributed to Sunday Bridges. Ah, me....this is just lovely. That certainly dominates the skyline!